An NRL research team led by physicist, Dr. Ted Jones, Plasma Physics Division, performed the first successful long distance acoustic propagation and shock generation demonstration of their novel underwater photo-ionization laser acoustic source. These tests, performed at the Lake Glendora Test Facility of Naval Surface Warfare Center-Crane, expanded on their earlier laboratory research on pulsed laser propagation through the atmosphere. Using a pulsed Nd:YAG (Neodymium-doped Yttrium Aluminum Garnet) 532 nanometer wavelength laser housed in a floating platform, pulses were directed by steering mirrors down through a focusing lens and into the water surface. 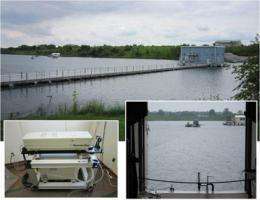 Each laser pulse produced an acoustic pulse with a sound pressure level of approximately 190 decibels (dBs), which was detected and measured by boat-mounted hydrophones at distances up to 140 meters, roughly the length and a half of a football field. Prior laboratory acoustic propagation distances were limited to about three meters. "The goal of this laser acoustic source development is to enable efficient remote acoustic generation from compact airborne and ship-borne lasers, without the need for any source hardware in the water," said Jones. "This new acoustic source has the potential to expand and improve both Naval and commercial underwater acoustic applications." The driving laser pulse has the ability to travel through both air and water, so that a compact laser on either an underwater or airborne platform can be used for remote acoustic generation. A properly tailored laser pulse has the ability to travel many hundreds of meters through air, remaining relatively unchanged, then quickly compress upon entry into the water. Atmospheric laser propagation is useful for applications where airborne lasers produce underwater acoustic signals without any required hardware in the water, a highly useful and efficient tool for undersea communications from aircraft.